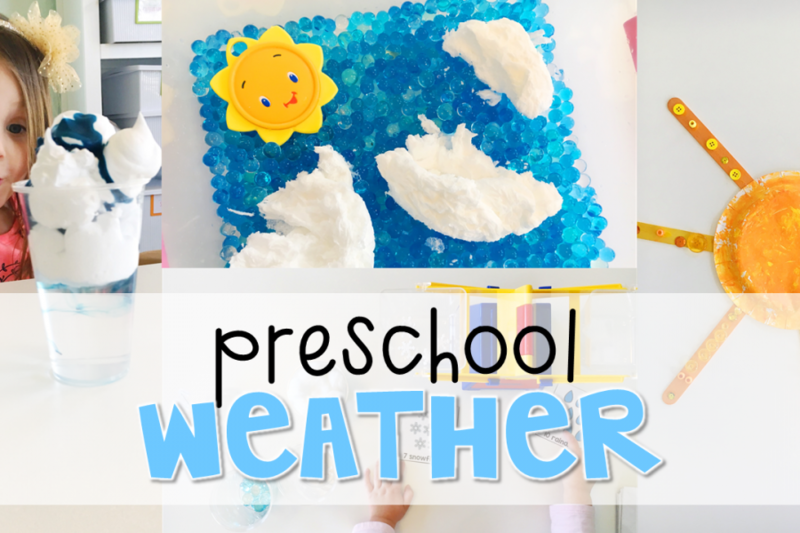 Weather is such a fun topic for preschool because it is one of the few science concepts that this age group already has lots of knowledge about. I love building up my little one’s vocabulary and trying out experiments to show how weather works. I chose our first read aloud, Hello, World! Weather by Jill McDonald, because it is an overview of lots of different kinds of weather and what types of things you need for each. If you’ve ever tried to dress a 3-4 year old for the weather, you know the struggle to give them independence while not allowing them to wear flip flops in the snow. We talked about why it is important to check the weather before getting dressed and especially before leaving the house, then drew pictures of what to wear in sunny, windy, rainy, and snowy weather. Next we read 4 books from the Weather Basics Series by Erin Edison (Sunlight, Wind, Rain and Clouds). To build weather vocabulary we played weather word memory using picture cards and talked about the meaning of each as we made matches. Over 2 days we practiced weather vocabulary even more by making a weather vocabulary book. Madelynn used the same vocab cards from our memory game as a reference to illustrate each new word from the Weather Basics Series books (Sunlight, Wind, Rain and Clouds). Our last book was the Blow, Wind, Blow from the Scholastic Little Leveled Readers set. To get Madelynn ready to read easy level A books with patterned text I read this book to her first. Each page followed the pattern “Blow, wind, blow. Blow the ___ ” So as I read to her I paused and modeled how I looked at the picture to read the last word each time. Then I had her read the text back to me pointing to the words. Our first literacy activity this week was a rain themed salt tray. Madelynn used raindrop letter cards as a model and chose which ones she wanted to practice. To add a bit more fun, we used small cocktail umbrellas for writing each letter. Next, for more letter practice we used our dot stampers. We started out stamping inside the letter to make a U. Then Madelynn had to find the upper and lowercase u’s in the umbrella, stamp them and make the “U” sound each time. 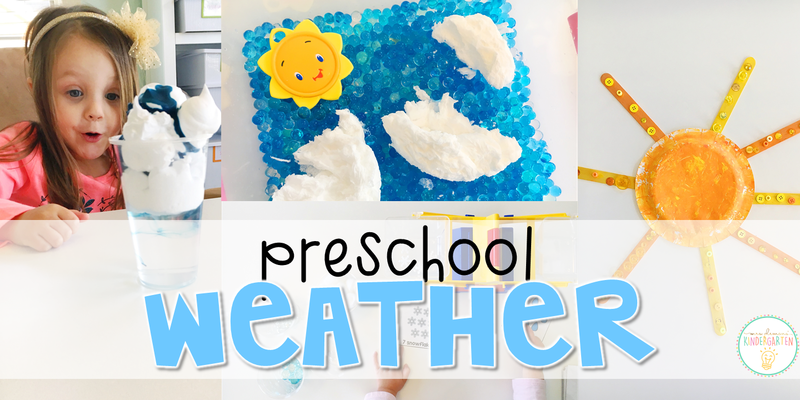 For this week’s name craft we created a super cute rain cloud. First Madelynn cut the cloud and raindrops out. Then as she traced the letters in her name on each raindrop, I taped pieces of fishing line under the cloud for each drop. After she finished tracing, she taped the raindrops to the bottom of each piece of fishing line in order to spell her name. For our journal this week Madelynn chose to draw and write about what she would wear in rainy weather. She drew a raincoat, boots, and an umbrella. I encouraged her to label each item and she wrote U for umbrella, B for boots, and O for coat. Our new math focus for the week is measurement, so we started out with the concept of short and tall. I printed thermometer cards in varying lengths, then Madelynn put them in order from shortest to tallest. To continue working on counting and identifying numbers, Madelynn worked on this color by code activity. Madelynn counted the dots then had to follow the directions to make each spot the correct color. Now that we’ve been doing these activities for a few weeks she is getting very fast at identifying the number of dots with a quick glance. Madelynn was super excited about playing with our new balance scale, so I had her play and explore with it for a while before introducing our activity. 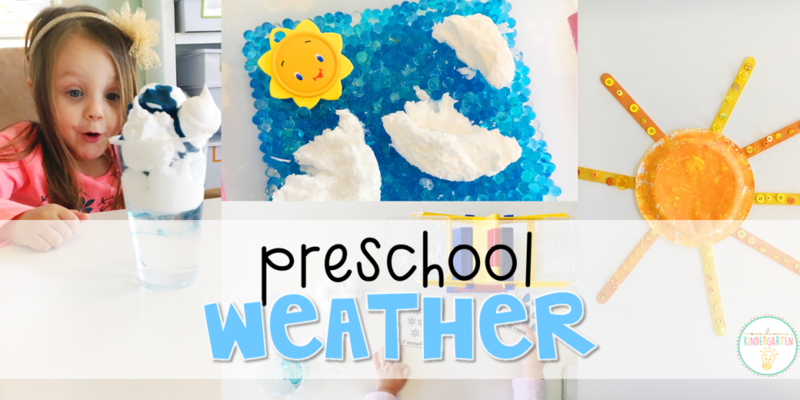 Then I laid out weather manipulatives for weighing (sun-rattle, clouds-cotton balls, rain-blue gems, hail-clear marbles, lightning-pipe cleaners, snow-foam snowflakes). Madelynn chose 2 cards and counted out the correct number of each item to compare. Afterwards she decided which one was light and heavy. We used these mats for LOTS of math practice this week. First, Madelynn identified the large number. Then she made it with play dough and counted the raindrops in the ten frame. Next, she used a dry erase marker to practice writing the number, and finally used blue gems as raindrops for underneath the cloud. Our last measurement activity for the week was a fun way to try out measuring with non-standard units. I taped large numbered raindrops our jumbo Melissa and Doug blocks. Madelynn stacked them up to measure herself, me and her sister which alo turned into a great way to practice number order as well. For this sensory bin I had Madelynn help me create the clouds by putting the ivory soap in the microwave. If you’ve never tried this before it is seriously so cool! Put a bar of plain white Ivory soap in a large microwave safe bowl (emphasis on large because this soap will expand more than you can imagine.) Then microwave for 2 ish minutes. You can go longer if you want, it definitely won’t hurt anything but there will be a point where the soap stops expanding. Then watch as the soap explodes into a giant fluffy cloud! remove from the microwave and allow to cool. Pull the “cloud” out of the bowl in clumps and add to a sensory bin full of water beads to play with and explore. As a bonus the soap cleans our water beads and makes them smell awesome. Afterwards simply rinse the soap off in a strainer and you can save the water beads for future use. Our first craft was this paint drop wind sock. We started out with a piece of white cardstock taped to the inside of our sensory bin. Then I filled mini cups with liquid watercolors. Madelynn used pipettes to drip the colors of paint starting near the top of the paper for a fun rainbow effect. After the paint dried, I helped Madelynn roll her paper into a tube and staple it. Then I gave her strips of ribbon and a stapler to attach them to the bottom. Last, I tied a piece of yarn at the top and we took it outside to see it blow in the wind. And of course there was literally NO wind when we went out, but Madelynn was happy to wave it back and forth to test it out. Then we found a place to hang it near a window so we can take a look at it in the future. 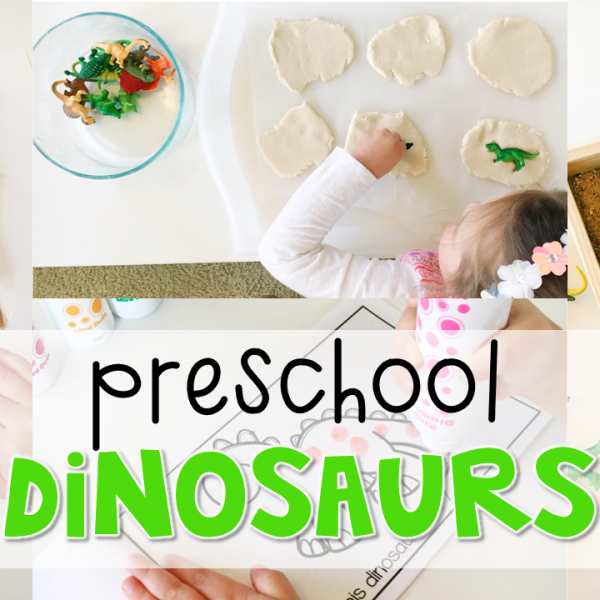 For preschool I like to keep our experiments super simple, just to introduce concepts, spark curiosity and answer questions. This week we worked on observing like a scientist. The look on Madelynn’s face says it all, she was AMAZED by this easy rain cloud experiment. First we filled a cup 3/4 of the way with cold water. Next, I filled the top of the cup with shaving cream. Then, Madelynn dripped blue food coloring onto the cloud. Finally we waited and watched to see what would happen. As the food coloring started to fall lower in the cloud Madelynn was so excited to see rain entering the bottom of the cup. Afterwards I had her draw a quick picture of what she observed. Our second art activity this week was a sunny mixed media collage. First, Madelynn painted a small round plate orange and yellow. I introduced a new painting technique using a ball of aluminum foil as a brush to create a really interesting texture. Then I hot glued yellow and orange popsicle sticks on the back of the plate for the sun’s rays. Last, Madelynn used white glue to add pony beads, gems, sequins and buttons to each ray. In this bin, Madelynn used the tweezers to search for and grab each weather item then match it to the I-spy cards. This is great! 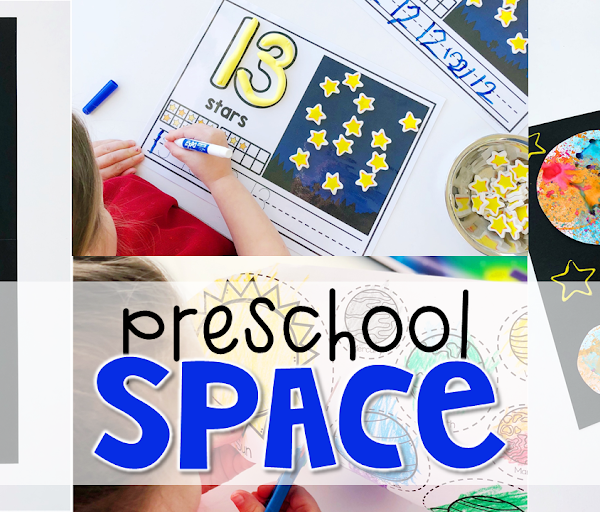 Do you have the printables to share? I would love to add this to our weather theme! I have just finished this unit and added it to Teacher pay Teachers. 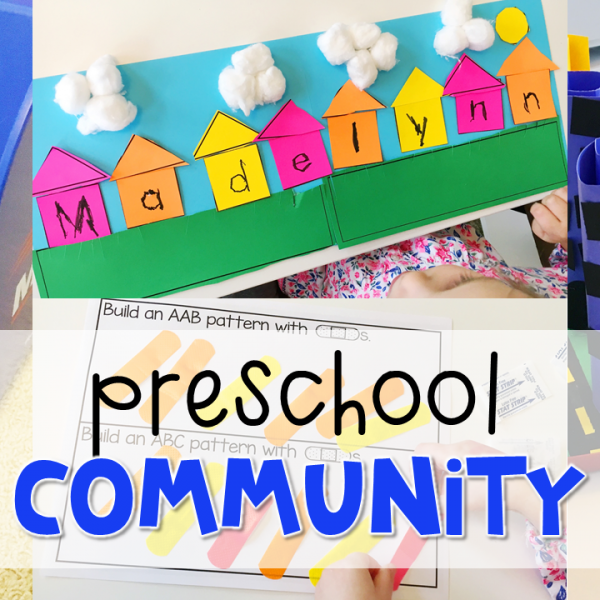 You can find the unit here: https://www.teacherspayteachers.com/Product/Preschool-Weather-Plans-and-Printables-3758758 Thanks so much! 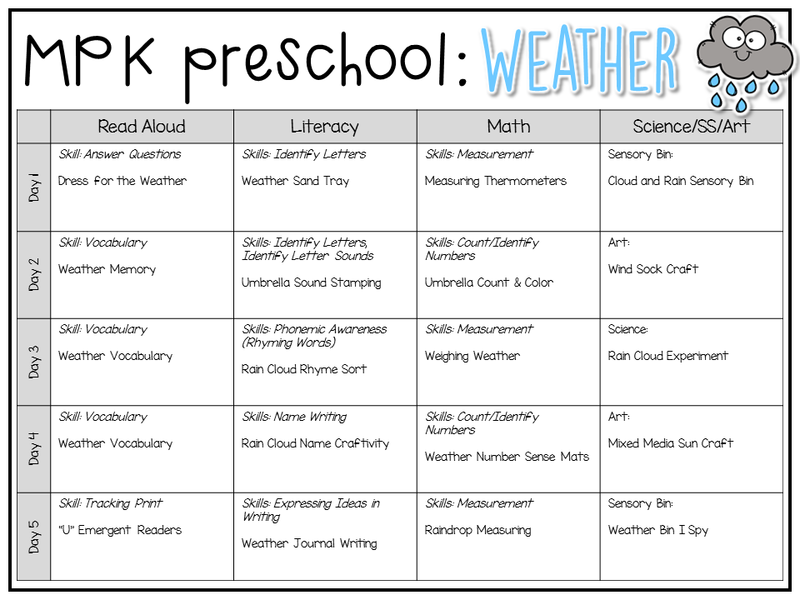 I did not find a link to download or purchase any of these amazing resources for weather. Can you please let me know how I can have some of these for my classroom too. 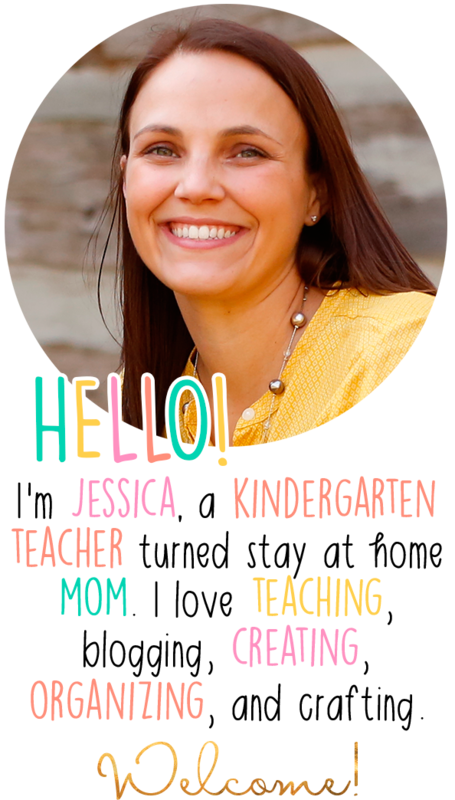 how can I get the cloud name & raindrop measuring printables? I would love this link too! 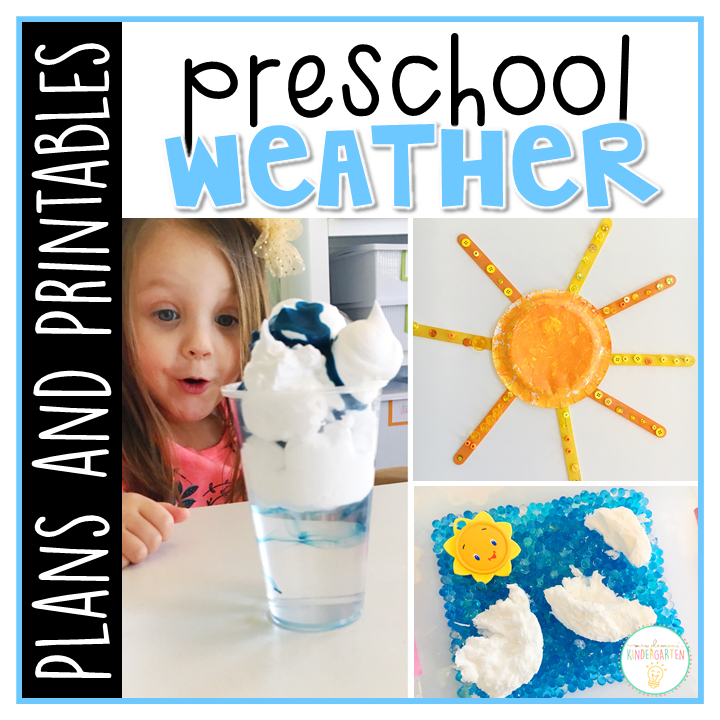 Do you have the weather printables to share? Ive looked everywhere for the rain cloud rhyming sort activity printable. Where can I get a download of it. Yes please share any info about downloading or purchase. 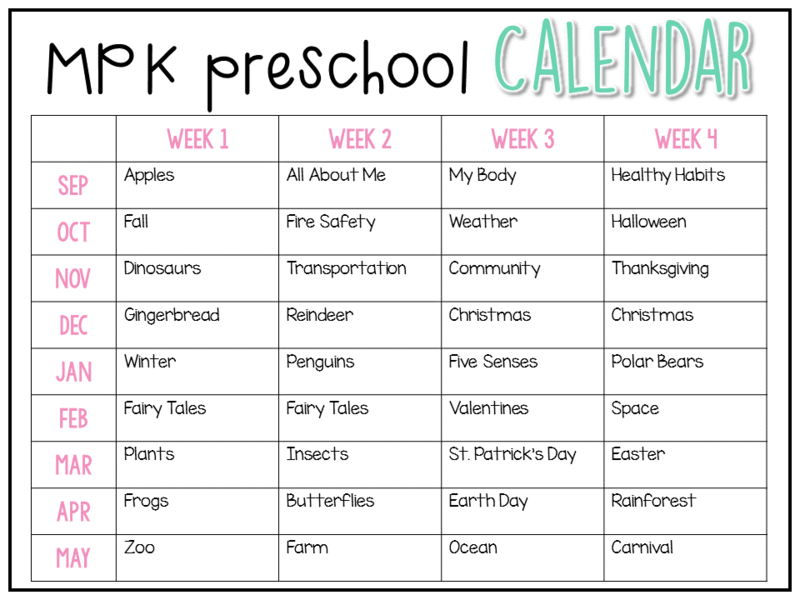 I LOVE THIS and would love to know how I could get copies of your printables! Thanks! Do you have a link to download/purchase these printables? 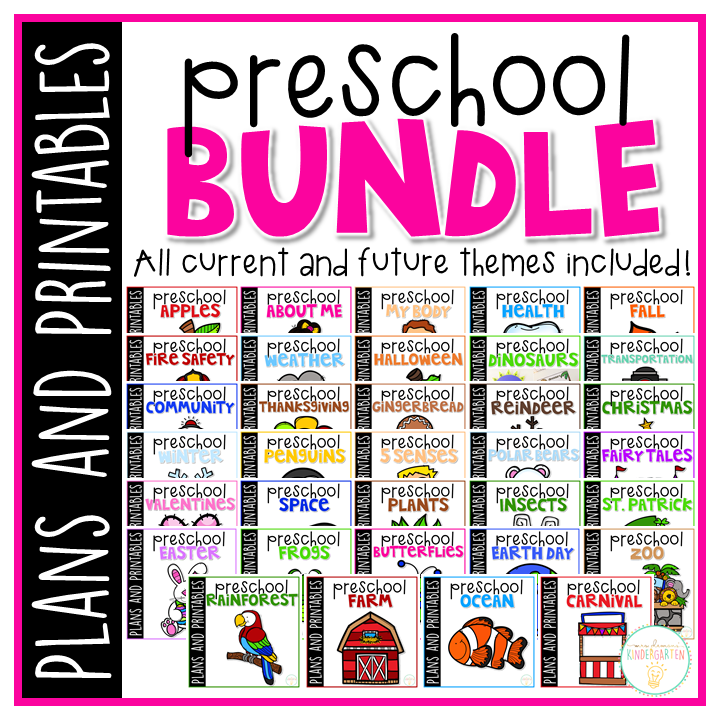 I would also love these printables! Is there a way to purchase this unit? LOVE IT! Where can we get the Rhyme Weather printable? These ideas are so awesome! Can you please send me a link for the weather activities, I am wanting the rhyming cards. Where are the links to purchase or download some of these activities?? I would like to know is there a link to purchase these printables or a link for you to share please? I would also love the printables! 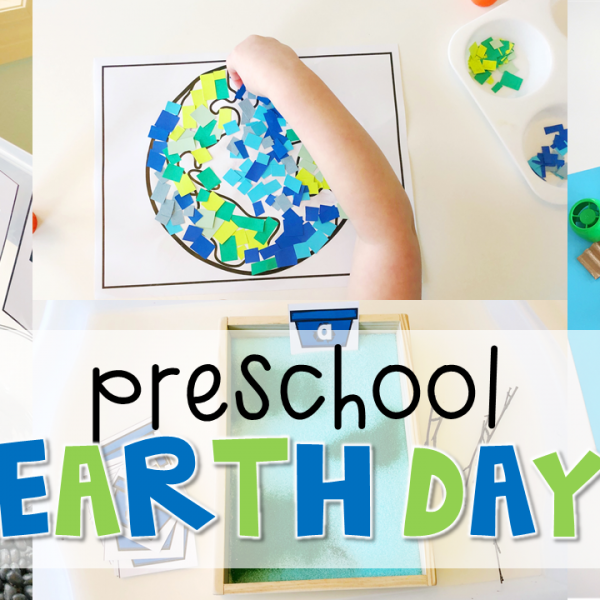 Do you know what date the printables will be available? I would LOVE to get this for my upcoming Weather unit!!! !